Like I said last week, that trend table makes it very obvious that the short and intermediate term trends are down while the long-term trend is up on all the indices. That alone gives a trader a ton of valuable information. If you trade with the trend then, unless you're a long-term trader (investor? 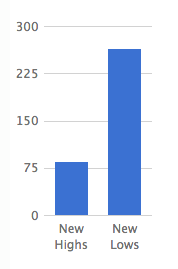 ), you probably should not be initiating long positions right now. If you're willing to play the short side that is the path of least resistance for short and intermediate-term trades. 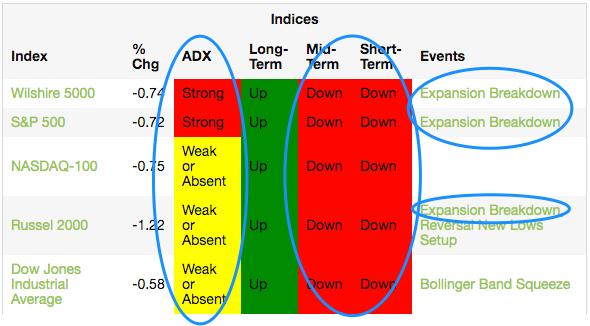 I also find the ADX column interesting. It's showing strong downtrends on the S&P 500 and Wilshire 5000 and non-existent trends on the other indices. ADX is "The Trend Strength Indicator" -- SwingTradeBot uses the default setting of 14 bars (days) to calculate ADX. It's important to note that ADX is a lagging indicator, so it's not going to get you in at the start of a trend but it can confirm trendiness and the strength of trends. The other thing that stands out to me today is the "Expansion Breakdown" alerts on the S&P 500, Russell 2000 and Wilshire 5000. That means that those indexes made new 2-month lows with the largest range in almost 2 weeks... So there's not a lot for bulls to like in the market right now based on that trend table. 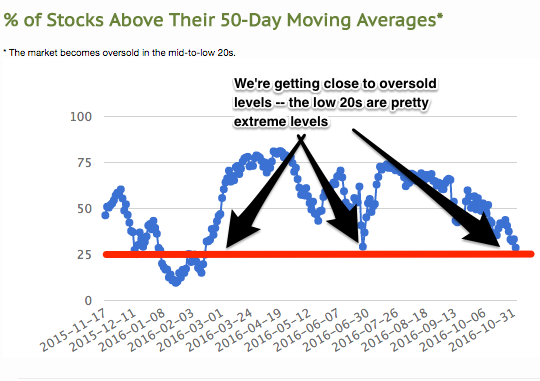 One of my favorite indicators on that page is the Percent of Stocks Above their 50-day Moving Averages. Most of the time this indicator isn't very interesting, but once it hits certain levels it's critical to heed its message! This is similar to Worden's T2108 indicator that I used to blog about way back in the day. 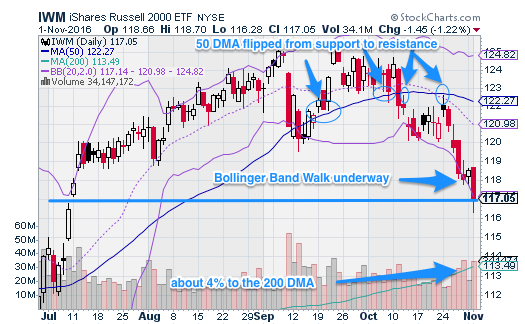 T2108 uses the 40-day moving average while I'm using the 50 DMA, so my critical level is a little higher than T2108's. This indicator serves as an overbought/oversold indicator (I like it much better as an oversold indicator). 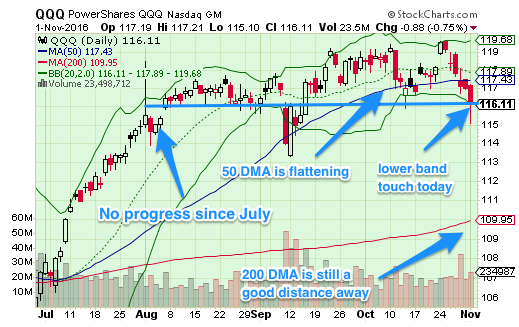 Once my version gets into the low 20s that's a good sign the market is very oversold. Another good piece of information on the General Market page is the chart of new 52-week highs vs. new 52-week lows. We had 86 new highs today vs. 265 new lows! Not what you want to see if you're a bull. Note that the 200-day moving averages aren't very far away for the indices (aside from the Nasdaq). In my note the other day I mentioned the long-term trend possibly pushing the shorter term trends upward. I can easily see a scenario where the indices are perched very close to the 200-day moving averages just before the election next week. The market often seems to end up at critical technical junctures for events like that. 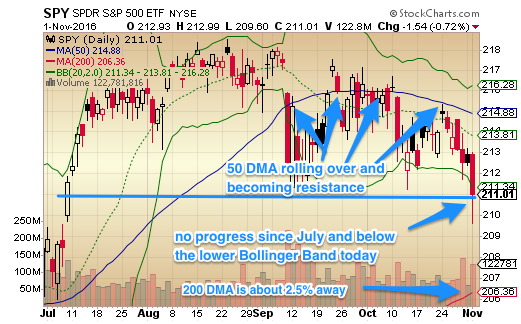 The 200-day averages are supposed to be where long-term players like mutual funds put money to work, so if we get to those lines the action will be very telling. My modus operandi for the last few weeks, given the chop, has been to do less and less as far as actual trades. I never like to initiate a lot of trades during the heart of earnings season anyway because the market is so news driven. So I've been content to simply curate my watchlists and wait for something to spark a move out of the choppiness. I (of course) have no clue which direction the chop will resolve. My guess is that we'll see a post-election bounce (which might start ahead of election day) but who knows if that will be anything more than just a short-overing relief rally. So that's a glance into how I continue to leverage the General Market Analysis page to quickly get a feel for the market. Starting with this high level read often keeps me out of trouble since it puts the overall market's direction (or lack thereof) at the front of my mind before I go looking for trending candidates that may not be in alignment with the market.